Looking for a fun and affordable family trip? Head to Cleveland, Ohio check into the Hampton Inn and be sure to ask for the Rock & Roll Hall of Fame Package. You'll get overnight accommodations, free parking, a hot breakfast, plus two tickets to the fantastic R&R HoF, located less than a mile from the hotel. Looking for a fun and affordable family trip? Head to Cleveland, check into the Hampton Inn and be sure to ask for the Rock & Roll Hall of Fame Package. You'll get overnight accommodations, free parking, a hot breakfast, plus two tickets to the fantastic R&R HoF, located less than a mile from the hotel. Rates begin at $139/N. As you approach the Hall, an amazing glass building designed by I.M. Pei overlooking Lake Erie, you'll begin to hear music on the outdoor plaza and you'll get right into the groove. 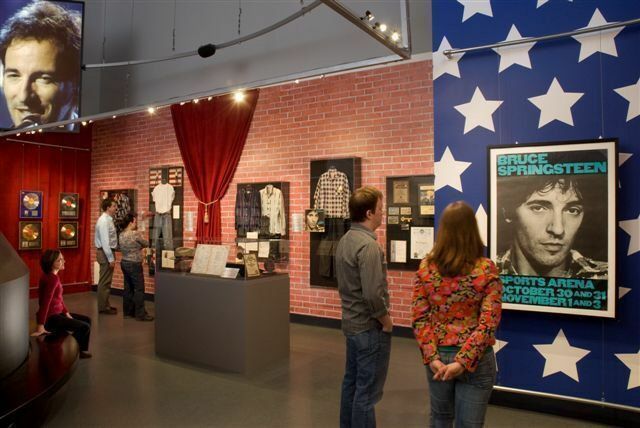 Click on FTF's guide to Cleveland Attractions to read coverage of the Rock and Roll Hall of Fame and Museum, the Great Lakes Science Center located right next door, as well as other Cleveland family sights. Through the end of 2010, all of you fans of "The Boss" will delight in the special exhibition "From Asbury Park to the Promised Land: The Life and Music of Bruce Springsteen," which traces his career from his bands on the Jersey Shore to the present. Artifacts such as handbills from his early days, handwritten lyrics, posters, clothing, instruments and other memorabilia, with a large screen presenting various performances will make his fans want to scream "Bruce, Bruce, Bruce!" Another special exhibit this summer is entitled "Motown: The Sound of Young America," mounted in tribute to the 50th Anniversary of Motown. This great music is explored through songs and memorabilia of the Temptations, Marvin Gay, the Four Tops, Stevie Wonder, Martha and the Vandellas and the Jackson 5, with a video of the very young Michael performing and smiling from ear to ear. If you need to sit down for a while after strolling through the exhibits, check out some of the seven hours of films shown in four theatres throughout the museum. "Hall of Fame Film" is a multi-media presentation on three giant screens. It combines film footage, music, interviews, animation and still photography, and tells the story of the Rock and Roll Hall of Fame inductees. Beginning in 1986, it is told year by year until the current class takes center stage, and is often cited as a highlight of a visit to the museum. Also worth your time are the "R&R HoF 25th Anniversary Concerts" filmed in 2009 at Madison Square Garden in New York City featuring four hours of performances by Crosby, Stills and Nash, Simon and Garfunkel, Stevie Wonder, Bruce Springsteen, Jerry Lee Lewis, Bonnie Raitt, Jackson Browne, Jeff Beck, Sting, Aretha Franklin, Patti Smith, U2, Metallica, Mick Jagger and many others.